The Houston Dash had an offensive outburst on Saturday night, besting Sky Blue FC 3-2 for their first win of the season in front of a crowd of 2,065 at Yurcak Field in Piscataway, New Jersey. The Dash improved to 1-3-2 (5 points) and Sky Blue FC fell to 0-3-1 (1 point). Katie Johnson scored a brace for Sky Blue FC, but it wasn’t enough for them to get their first three points of the year. After Johnson leveled the match at 2-2 in the 73rd minute, the Dash hit the game-winner six minutes later. Second-half subs Veronica Latsko and Thembi Kgatlana combined to put the Dash up 3-2 with Latsko scoring the first goal of her NWSL career. The Dash moved Rachel Daly and Kristie Mewis up into the attack on the evening, after the pair played as outside backs for the first five games of the season. It paid off as Daly was involved in several chances, and scored her first goal of the season in the 59th minute. Johnson started for Sky Blue FC in the game, and earned the first brace of her career. Both of her goals tied the match. First in the 57th minute, shortly before Daly put the Dash ahead. Then Johnson leveled it again with a header goal in the 73rd minute. The Dash hadn’t scored since Week 1, but found an offensive groove in Week 6. Sky Blue controlled possession 58.5% to 41.5%, but the Dash outshot Sky Blue 17-11 and 6-3 in shots on goal. Houston will next host Portland Thorns FC on Wednesday night. Sky Blue FC will visit Seattle Reign FC on Saturday night. Match ends, Sky Blue 2, Houston Dash 3. Second Half ends, Sky Blue 2, Houston Dash 3. Foul by Thembi Kgatlana (Houston Dash). Corner, Sky Blue. Conceded by Veronica Latsko. Substitution, Houston Dash. Savannah Jordan replaces Nichelle Prince. Janine Beckie (Sky Blue) wins a free kick on the left wing. Substitution, Sky Blue. Jennifer Hoy replaces Christina Gibbons. Substitution, Sky Blue. Madison Tiernan replaces Katie Johnson. Rachel Daly (Houston Dash) is shown the yellow card. Attempt missed. Katie Johnson (Sky Blue) right footed shot from the right side of the box is close, but misses to the left. Assisted by Savannah McCaskill. Attempt missed. Kyah Simon (Houston Dash) right footed shot from outside the box is too high. Assisted by Thembi Kgatlana. Goal! Sky Blue 2, Houston Dash 3. Veronica Latsko (Houston Dash) left footed shot from very close range to the centre of the goal. Assisted by Thembi Kgatlana. Substitution, Houston Dash. Thembi Kgatlana replaces Kealia Ohai. Attempt saved. Nichelle Prince (Houston Dash) right footed shot from outside the box is saved in the bottom right corner. Goal! Sky Blue 2, Houston Dash 2. Katie Johnson (Sky Blue) header from the centre of the box to the bottom left corner. Assisted by Sarah Killion with a cross following a corner. Corner, Sky Blue. Conceded by Amber Brooks. Substitution, Houston Dash. Veronica Latsko replaces Lindsay Agnew. Offside, Houston Dash. Kyah Simon tries a through ball, but Nichelle Prince is caught offside. Corner, Sky Blue. Conceded by Haley Hanson. Offside, Houston Dash. Kealia Ohai tries a through ball, but Rachel Daly is caught offside. Attempt missed. Shea Groom (Sky Blue) right footed shot from the right side of the box is high and wide to the right. Assisted by Katie Johnson. Attempt saved. Rachel Daly (Houston Dash) right footed shot from the centre of the box is saved in the centre of the goal. Assisted by Kristie Mewis with a through ball. Savannah McCaskill (Sky Blue) is shown the yellow card for a bad foul. Kyah Simon (Houston Dash) wins a free kick in the defensive half. Offside, Houston Dash. Nichelle Prince tries a through ball, but Kealia Ohai is caught offside. Attempt missed. Katie Johnson (Sky Blue) left footed shot from outside the box misses to the left. Assisted by Savannah McCaskill. Goal! Sky Blue 1, Houston Dash 2. Rachel Daly (Houston Dash) right footed shot from a difficult angle and long range on the right to the top right corner. Assisted by Kealia Ohai following a set piece situation. Rachel Daly (Houston Dash) wins a free kick on the right wing. Goal! Sky Blue 1, Houston Dash 1. Katie Johnson (Sky Blue) right footed shot from very close range to the centre of the goal. Assisted by Shea Groom. Attempt blocked. Katie Johnson (Sky Blue) right footed shot from the right side of the box is blocked. Assisted by Savannah McCaskill with a through ball. Rachel Daly (Houston Dash) wins a free kick in the defensive half. Attempt blocked. Lindsay Agnew (Houston Dash) left footed shot from outside the box is blocked. Attempt blocked. Kyah Simon (Houston Dash) right footed shot from outside the box is blocked. Savannah McCaskill (Sky Blue) wins a free kick in the attacking half. Foul by Lindsay Agnew (Houston Dash). Offside, Sky Blue. Katie Johnson tries a through ball, but Savannah McCaskill is caught offside. Substitution, Sky Blue. Shea Groom replaces Raquel Rodríguez. Second Half begins Sky Blue 0, Houston Dash 1. First Half ends, Sky Blue 0, Houston Dash 1. Attempt missed. 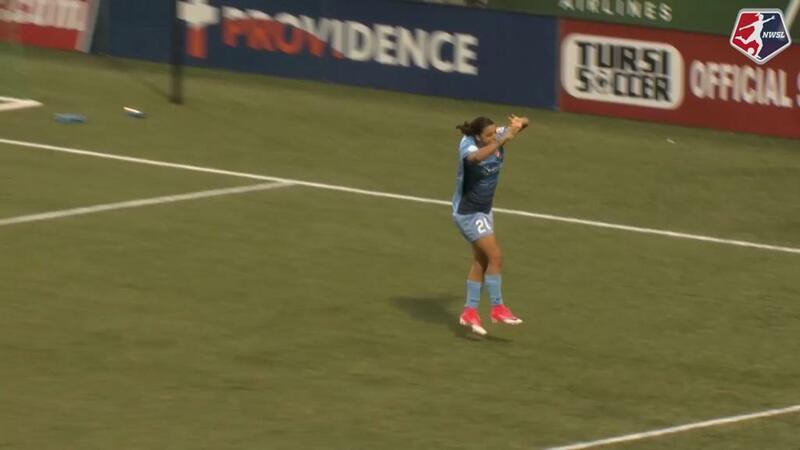 Carli Lloyd (Sky Blue) right footed shot from the centre of the box misses to the left. Assisted by Savannah McCaskill. Attempt blocked. Katie Johnson (Sky Blue) right footed shot from outside the box is blocked. Assisted by Raquel Rodríguez. Foul by Haley Hanson (Houston Dash). Christina Gibbons (Sky Blue) wins a free kick in the defensive half. Foul by Kimberly Keever (Houston Dash). Corner, Houston Dash. Conceded by Erica Skroski. Corner, Houston Dash. Conceded by Christina Gibbons. Attempt blocked. Kristie Mewis (Houston Dash) left footed shot from the left side of the box is blocked. Hand ball by Nichelle Prince (Houston Dash). Attempt blocked. Lindsay Agnew (Houston Dash) header from the left side of the six yard box is blocked. Assisted by Kristie Mewis with a cross. Attempt missed. Rachel Daly (Houston Dash) left footed shot from outside the box is close, but misses to the right. Assisted by Kristie Mewis. Janine Beckie (Sky Blue) wins a free kick in the defensive half. 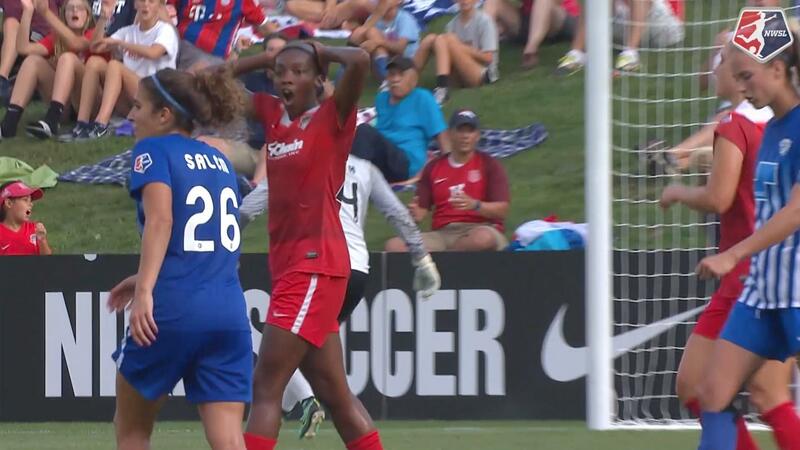 Foul by Nichelle Prince (Houston Dash). Attempt blocked. Kyah Simon (Houston Dash) right footed shot from the centre of the box is blocked. Assisted by Rachel Daly. Attempt missed. Rachel Daly (Houston Dash) header from the centre of the box is too high. Assisted by Kealia Ohai with a cross following a corner. Goal! Sky Blue 0, Houston Dash 1. Nichelle Prince (Houston Dash) right footed shot from very close range to the bottom left corner. Assisted by Lindsay Agnew following a corner. Attempt missed. Kealia Ohai (Houston Dash) right footed shot from the left side of the box is close, but misses to the right. Assisted by Nichelle Prince. Offside, Houston Dash. Amber Brooks tries a through ball, but Nichelle Prince is caught offside. Attempt missed. Amber Brooks (Houston Dash) header from the centre of the box is close, but misses to the left. Assisted by Lindsay Agnew following a corner. Corner, Houston Dash. Conceded by Rebekah Stott. Attempt blocked. Rachel Daly (Houston Dash) right footed shot from the centre of the box is blocked. Assisted by Kyah Simon. Attempt missed. Kealia Ohai (Houston Dash) right footed shot from the left side of the box misses to the right. Assisted by Kristie Mewis. Attempt blocked. Sarah Killion (Sky Blue) right footed shot from the left side of the box is blocked. Assisted by Katie Johnson. Lindsay Agnew (Houston Dash) wins a free kick in the defensive half. Hand ball by Kyah Simon (Houston Dash). Attempt blocked. Carli Lloyd (Sky Blue) right footed shot from outside the box is blocked. Offside, Houston Dash. Lindsay Agnew tries a through ball, but Kyah Simon is caught offside. Attempt saved. 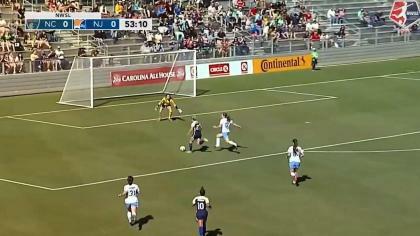 Carli Lloyd (Sky Blue) left footed shot from outside the box is saved in the centre of the goal. Assisted by Savannah McCaskill. Attempt missed. Rachel Daly (Houston Dash) right footed shot from outside the box is close, but misses to the right. Assisted by Kristie Mewis. Attempt saved. Kealia Ohai (Houston Dash) right footed shot from the left side of the box is saved in the centre of the goal. Assisted by Rachel Daly with a headed pass.